This powered air purifying respirator includes three head covers, a vinyl belt, breathing tube covers and external charge adaptor. Helps provide respiratory protection for system decontamination, such as health care isolation wards and first receiver locations. Jaco Aerospace and Industrial is your one stop resource for 3M(TM) Air-Mate(TM) Vinyl Belt-Mounted High Efficiency (HE) Powered Air Purifying Respirator (PAPR) System, Respiratory Protection AMH-12U 1/cs and all of your 3M Products, Tapes, aerospace and industrial needs. SKU Marketplace Product Description: This powered air purifying respirator includes three head covers, a vinyl belt, breathing tube covers and external charge adaptor. 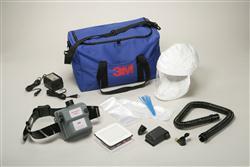 Helps provide respiratory protection for system decontamination, such as health care isolation wards and first receiver locations.